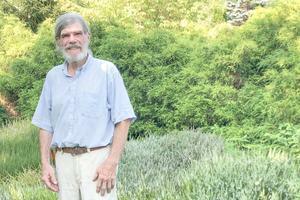 Don Church owns and operates Blue Hill Country Gardens, where he also creates unique specimiens of daylilies. Tucked behind tall, heavy hedges just along Route 15 in Blue Hill, is Blue Hill Country Gardens. Owner Don Church grows everything from several varieties of raspberries and tomatoes, to daylilies. What makes the garden special is that Church not only grows the daylilies, he creates them. Church bought the 22-acre property in 1998 and turned it into the garden in 1999. 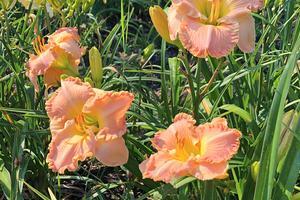 As a hybridist, Church uses much of the four acres dedicated to the garden as a space to breed and cross breed several different specimens of daylilies. With 83,000 types of daylilies recognized the world over, Church said it is important not to get stale. The process takes about seven years, from seed to selection. The later part of the process is when Church selects one flower from each of several different varieties he has planted, that he will then study for an additional amount of time before deciding whether or not to introduce them to the public. 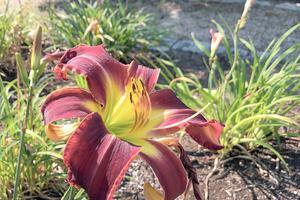 Church has developed daylilies of several shades of color, from deep purples and reds to bright oranges and yellows. He also creates edging along the petals of the flowers, which is done by mating a flower on top of another one. The layering creates a rippled effect on the flower. “I have mated up to six generations before,” he said. Currently, 23 registered daylilies have come from his gardens. The gardens feature 285 species of plants, in addition to the daylilies, and 100 types of evergreens. There are also 43 varieties of lilacs on the property, as well as a shaded seating area. Gardening has been a part of Church’s life since his younger years, as he remembers following his grandfather around in his garden decades ago. When his grandfather fell ill, he was eventually told he was no longer healthy enough to tend to his garden. He died a year later. Church experienced a bout of illness himself last year, when he was diagnosed with cancer. Knowing he was likely going to have to slow down while fighting the disease, he sold his tree farm, but kept the garden. “[My grandfather] was always moving, so when he couldn’t anymore, I think that’s what ended up being the end for him,” he said. Church continued to work in his garden as best he could and has since won the fight with his cancer. 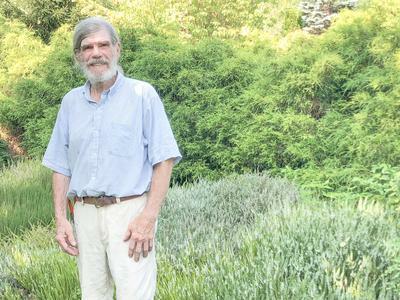 That battle, along with the constant exploration of coming up with new daylilies, has kept Church’s passion for his garden alive. “It’s fun to see [the flowers] every day. It gets you out of bed in the morning,” he said. Church has a small stand by the road for some of his fruits and vegetables, and also sells a small selection of his daylilies and lilacs. “It’s great to be able to share what I create with people,” he said. One of Church’s creations, Midnight Rabbit, is a deep red daylily. One of Church’s daylily creations, Princess Pink Cheeks, has edging along its petals.